Browse our online clothing catalogue showcasing our comprehensive range of corporate and leisure wear. We cater for orders of any size, from individuals to large businesses. We offer a printing and embroidery service to personalise or brand your items to help enforce your brand or cause. 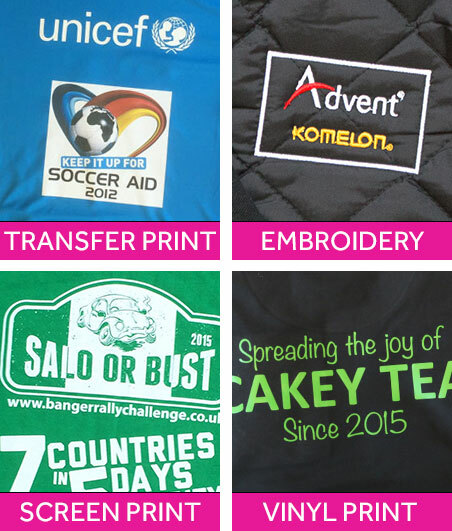 Featured below are examples of screen printing, embroidery and transfer printing onto various items from our corporate clothing range. Browse through our online catalogue above or if you prefer a printed copy then contact our friendly Sales Team. Embroidered polo shirts are one of our most popular products. All of the polo shirts within our catalogue are suitable for embroidery. To find the right embroidered product for you, simply browse through the range we have on offer. We can sew your logo anywhere on the polo shirt. The most popular positions for embroidered logos are front left chest, the sleeve or nape of neck. If you have a large design or require a large number of garments, we can screen print or digitally print your order depending on the designs required. For complex multi-colour designs for smaller quantities we would probably recommend digitally printed items, and for larger orders with less colours, screen printed items may be a better option. Feel free to contact us and then we can advise you on the best method to use. Call us today with any enquiries or to place and order!